Looking for a Level ____ Book? Have you ever come to the children’s desk and asked “Where can I find the level 1 books?” or “Where are your books with a Lexile number of…. ?” and received a long-winded round about answer? At the ALSC National Institute in Cincinnati, I attended a wonderful session on the history and uses of leveling and I thought that since I hear the leveling question often, this information would be useful for our community. It is well known that leveled reading is a dominant educational structure that most if not all caregivers and children learning to read will find themselves functioning within. Leveling books can be an extremely helpful tool in terms of finding books that children will be able to read independently. But it is just that, a tool, a guideline, not a hard and fast rule. If you take one thing away from this blog post I hope it is this: there is no such thing as a book that is ‘too easy’ or ‘too difficult’ for a reader at any level. That’s a bold statement right? But when you think about the why, it really starts to make sense. 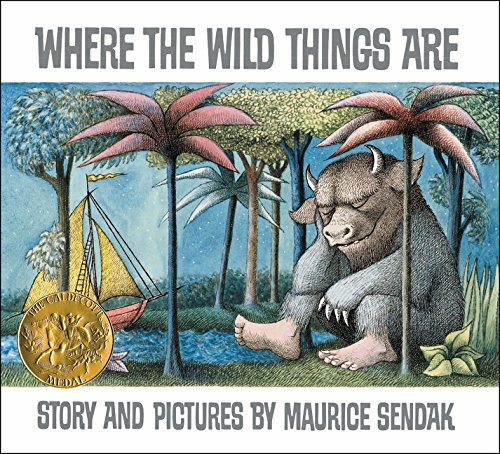 Leveling systems don’t account for content and each leveling system is different which is confusing–let’s take a look at a classic, Maurice Sendak’s “Where the Wild Things Are”. With a DRA of 16, and a Guided Reading level of ‘J’, Wild Things is about right for a 1st or 2nd grader. However, the Lexile measure is AD740L , AD meaning “Adult Directed” here indicates that this is a book generally read to a child, but an independent reader would be closer to this level anywhere from the end of grade 3 through grade 5. Another important thing to note is that background knowledge increases reader level. If I have a child who is really into dinosaurs with lots of knowledge about them, then they are going to be reading books about dinosaurs at a higher level than other books, and at a higher level than a child who does not have that background knowledge. So children have multiple reading levels of proficiency depending on their background knowledge and interests. Leveling can also lead to self-censorship–in order to continue reading at or above level then those books that are below level are not considered. Allowing children to independently read books that they have no difficulty reading does nothing but allow for practice and serves to improve confidence and proficiency. Reading books that are above level is great, but reading only books that are challenging can be discouraging and lead to frustration with the process. If it’s all drudgery, then when do we get to make reading fun? So, if your reader wants –insert interest–, then give them –interest–, but give them something else too, based on that interest, that might open up a door to another enjoyment. Often when parents ask me about leveled reading I hear this undercurrent of fear. When we say that third graders should be reading “at level” what we’re really saying is that by the end of third grade the average child is reading with a proficiency of ‘x’. The issue here is that reading skills, like most others, lie within a bell curve. While the center of the curve is the average third grade reading level by the end of the year, 50% of children will be above this and 50% will be below this center. This is to be expected, it’s perfectly normal and is not necessarily an indicator of future reading success. I often use myself, as a very late independent reader, as anecdotal evidence is these instances. The key is to make reading enjoyable and challenging at the same time. What better way to do this than to allow your readers the space and autonomy to select what they want to read for themselves based on their interests rather than their prescribed reading level? In short, levels are great, but they don’t account for individuality; it’s not about what we’re reading or when and how we’re reading it, it’s about reading, full stop. Great post! I can’t wait to check out Where the Wild Things Are so I can do some Adult Directed reading to my almost 3yo.